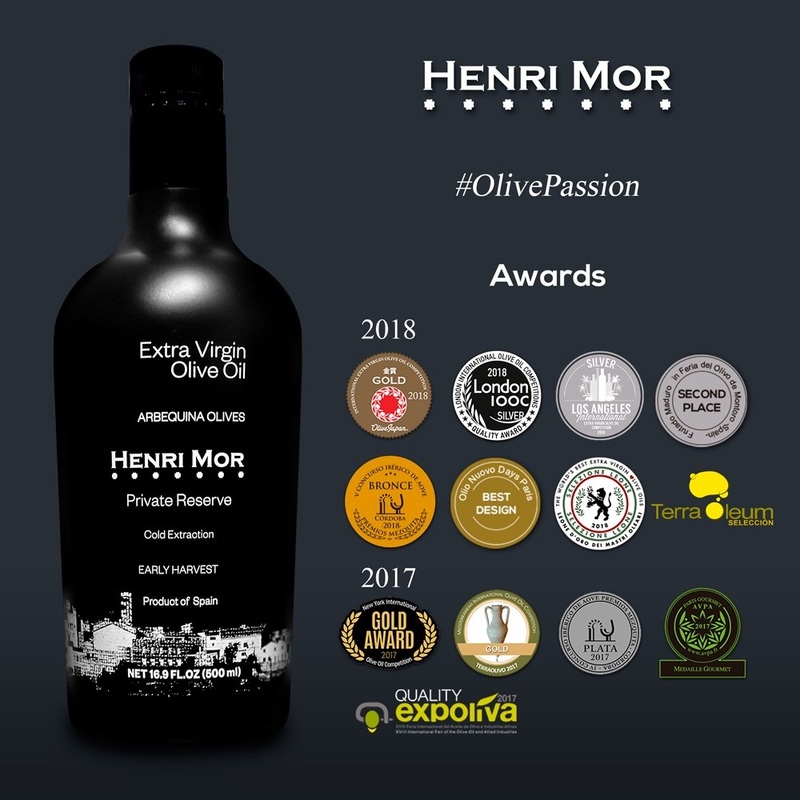 June 29, 2018 -- There are several reasons to celebrate and continue working with the enthusiasm and passion that define us: In 18 months, Henri Mor’s EVOO Private Reserve has received more than 13 international awards in the most prestigious competitions from the hand of the most outstanding tasters. Only in 2018 it received Gold Medal in Olive Japan, Silver Medal in London IOOC, Best Design in Olio Nuovo Days Paris, Quality Mention of Limited Production in Terra Oleum, Silver Medal in Los Angeles International EVOO Competition, Bronze Medal in Mezquita de Córdoba, Second Prize in Frutado Maduro in the Olive Fair of Montoro and Selection in the Leone de Oro Contest. "After hours of endless work in the field and in Almazara, and also traveling the world, we began to see the result of the harvest. For a variety like the Arbequina it is a fight like the one of David against Goliath in which today we can say that it was worth the effort, and we want to thank all the people that make this possible. We want to dedicate these awards to our customers and the EVOO lovers, and thank them for believing in us ", says Henri Alegria, Henri Mor´s director. Our Private Reserve is an EVOO designed with passion and its tasting notes reflect it. Its flavor is balanced and elegant. Its aromas of apple, pear, banana and green almond with light citrus notes and tropical fruits, give it a unique sensory profile. Its entry into the mouth is sweet and very elegant, the bitterness almost imperceptible with a light itching compensated. The aftertaste is very fruity, predominantly sweet fruit, green banana, and subtle touches of green almond. It is an oil that is characterized by its harmony, complexity and balance in its olfactory-gustatory notes. During 2017 we received Gold Medals from the TerraOlivo contest and from the New York International Olive Oil Competition. He also got the Diplôme Gourmet in the 15th. International Contest "The Oils of the World" AVPA, held in Paris, Silver Medal in Mezquita de Córdoba and EVOO Quality Mention in Expoliva for limited production in our homeland. Hence the smile of satisfaction of Henri Alegría, who in many opportunities has received in his hands, the fruit of the olive tree and has followed step–by-step the production process of extra virgin olive oil Henri Mor with the zeal and love of his ancestors, to the point of spreading the excitement and pleasure of this pleasant task to international juries and chefs of the world. In addition to the contests, we are proud that our EVOOs are been well received in prestigious kitchens of the world. "We are very honored to have been chosen by several Michelin Star Chefs, to be their tasting oil and to pair different dishes. Every day we work with passion to obtain a product of greater quality and to grant enjoyment for the senses ", says the director of the firm. We are continually innovating and changing to give you a better consumer experience. We incorporated the Bag in Box presentation for foodservice channel that has less environmental impact and helps to conserve the product. In addition our monodoses are available in premium oils for nautical and aeronautical sector. Another great news is that our entire portfolio of EVOOs has been certified as Non-GMO Project Verified. Henri Mor is a company with long-term vision that produces and exports high quality Extra Virgin Olive Oil and related products full of sensory attributes, passion and history. Its EVOOs are born from research, fields monitoring and innovation in the selection and processing of the best olives to satisfy the need of consumers seeking new sensory attributes. From the rural area, we have combined innovation, research and tradition with the aim of developing high quality products and connecting the consumer with the field, making its tasting a sensory experience. Not only do we produce premium olive oil, we also want to build an EVOO lovers community.